Want to be notified of new releases in MikeCodesDotNET/My-StepCounter? Time to get active, lose weight, lower your blood pressure, live longer, and feel better! Download My StepCounter for free so you can enjoy this easy-to-use and beautifully designed pedometer app! Developed exclusively for iOS and Android 4.4+ devices, My StepCounter doesn’t require any special permissions and uses your device’s built in step counter, making the app extremely energy efficient. It's perfect for your on-the-go lifestyle! The easiest-to-use, most beautifully designed Pedometer App developed exclusively for iPhone 5s. Beautiful animations & user interface for daily tracking of your steps to reach your 10,000 step goal. Uses the built in Android step counter sensor found on select Android 4.4+ devices. 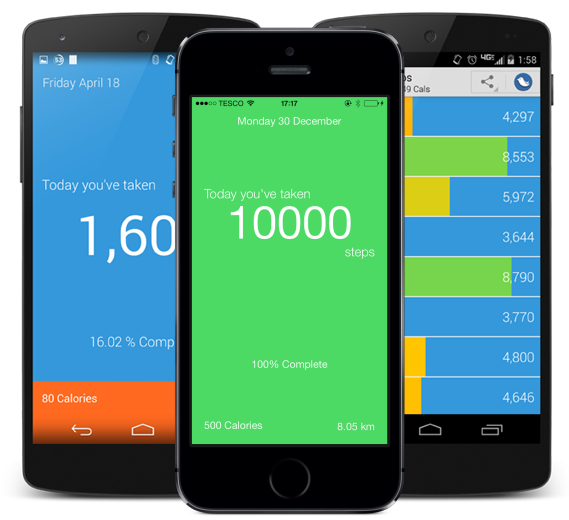 Both the Android and iOS versions of My StepCounter were built in C# with Xamarin Starter Edition!